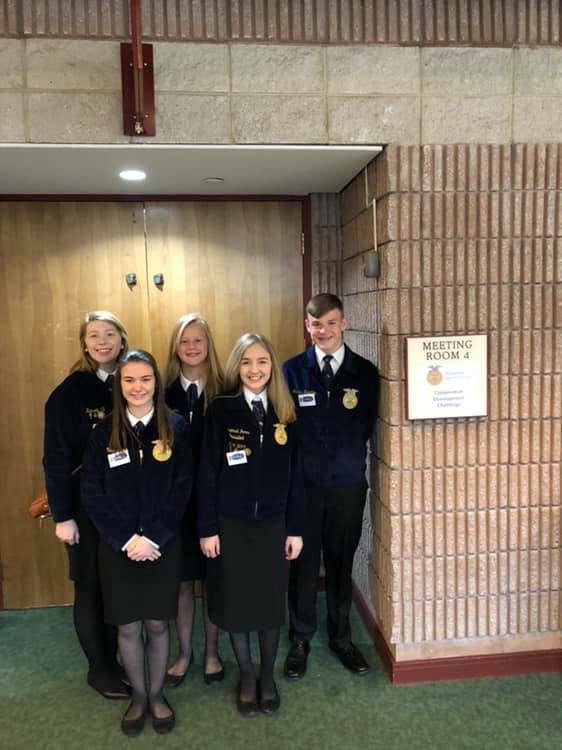 The Horace Maynard FFA Chapter is active in making a positive difference in the lives of Union County High School students by developing their potential for premier leadership, personal growth, and career success through agricultural education. The 91st Annual Tennessee FFA State Convention was recently held in Gatlinburg. Long time FFA Advisor John Fugate, along with new advisor Bailey Licata, accompanied a group of twenty heavily involved Union County students in attendance. Through the National FFA Program, students can work up the ladder of earning Greenhand, Chapter, State, and American FFA Degrees with a further amount of dedication being recognized at each level. Last fall, Tyler Sweet attended the National FFA Convention, receiving his American Degree, a huge honor. 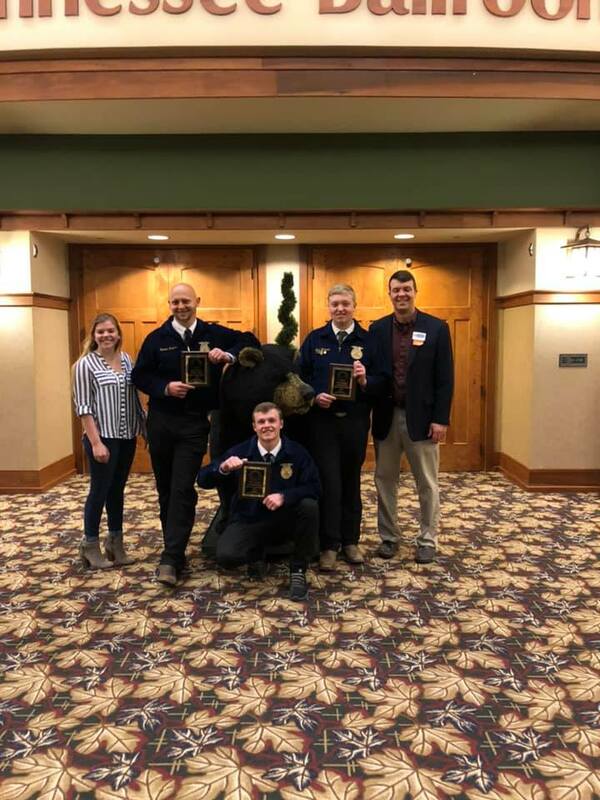 At the State Convention this spring, seniors Tanner Maples, Sawyer Henderson, and Zachary Hickman were respected in receiving their State FFA Degrees recognizing their excellence in agricultural work and involvement through all four years of high school. Also in Gatlinburg, the chapter had two competing teams. The Agriculture Issues Team was named as the East Tennessee Regional Champions placing as the top team facing five other teams from across the state. For this competition, the team debated the idea of putting a TCAT into Union County High School. Team members were Tucker Jones, Summer Beeler, Bradley Acuff, Kayla O’Mary, Hunter Boggs, Nathan Asher, and Keena Witt. The Cooperative Development Challenge Team members were named State Champions in their competition. This team was challenged to create a new agricultural cooperative from which Union County would benefit. Team members include Savannah Jones, Kennedy Hill, Chloe Bowman, Joshua Brantley, and Emma Moyers. State is the highest level for this competition and the team was offered a trip to Georgia for a cooperative conference. Tucker Jones and Hunter Boggs, sophomores, performed with their music at the convention in front of 3,500 members, guests, advisors, and alumni. Other FFA members in attendance included Justin Johnson, Andrew Anderson, Marissa Hickman, Jacob Hensley, and Kayla Faulkner. The students acted as delegates for the state meetings. The requirements for the degrees earned include a commitment to a chosen project with service hours, a certain grade point average, FFA involvement above the chapter level, and an excessive amount of hours or funds invested in a Supervised Agricultural Experience (SAE). SAEs are required for each degree and include entrepreneurship, placement, agriscience research, agricultural service learning, exploratory, improvement, and supplemental and directed school laboratory. The degree recipients, delegates, officers, performers, advisors, and members deserve a deep recognition for their devotion, enthusiasm, and hard work to the Horace Maynard FFA Chapter.